But Friendsgiving, that’s a whole other story! We love hosting (or attending) each holiday season. It’s not only a fun event with some of our favorite people but a great time to break out those “what if” recipes! As in what if this year we skip the full turkey and do Turkey burgers, Or what if we just did brunch and we’ll serve Turkey bacon and cranberry scones… You get the idea. In the world of Friendsgiving all of those things are possible. The Menu - Friendsgiving was made to be potluck style! Of course this does take some coordination on the host's part. Typically if we’re hosting we like to let our eager friends volunteer what they’d like to bring and then assign our less culinary inclined friends the remaining items to create a well rounded menu. Or in some cases certain friends are simply assigned napkins and ice. We’ll let you use your discretion on which friends those are. 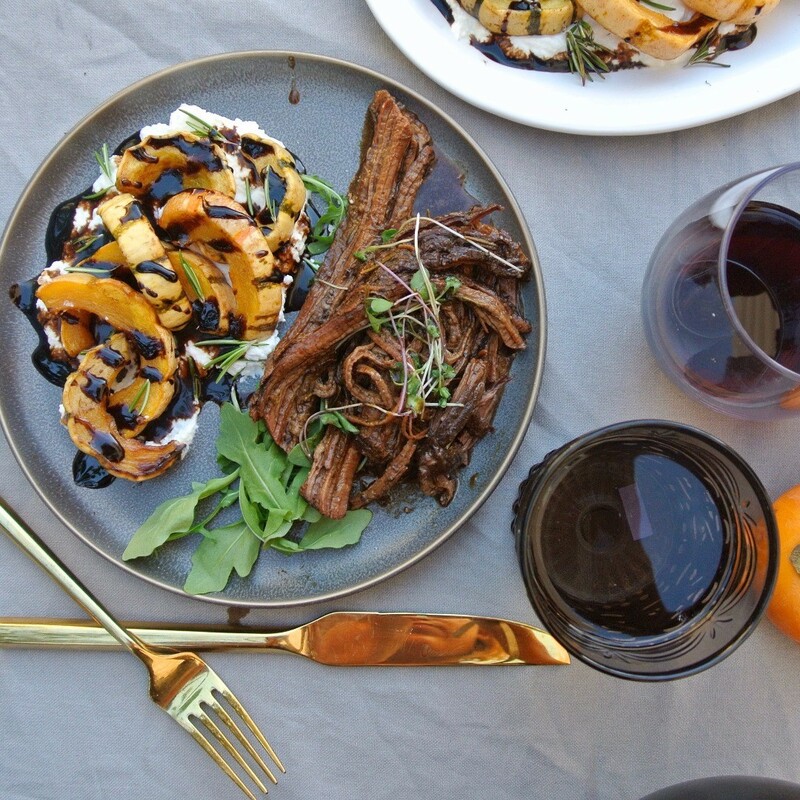 Sometimes we also like to designate a theme like Italian, bbq, deep fried (Friendsgiving really is a foodies dream holiday) etc. It’s a great chance to see everyone’s creativity in the kitchen! And if we are hosting we always take care of the Turkey (weather it be deep friend, grilled or roasted!). Because who’s gonna lug around a hot 30 pound bird from house to house? Typically as the host we’re also handling some side dishes to make sure there’s more on the table then 3 different types of potatoes. 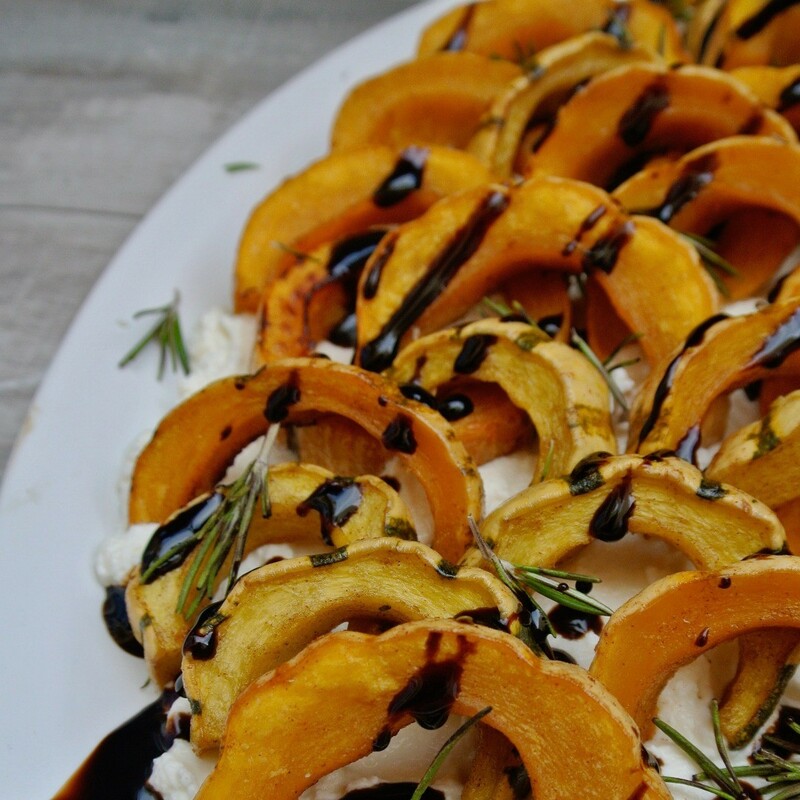 This year we’re making one of our favorite veggie side dish; Roasted Delicata Squash with ricotta, rosemary and MiaBella Balsamic Vinegar. This vegetable dish is so good that you’ll probably see it sneak onto our Thanksgiving table as well. Even the most finicky of eater will enjoy this dish. Not to mention it’s pretty easy on the eyes if we do say so ourselves. The Table - As for our Friendsgiving table we do love setting a full table-scape. Because that’s what friends are for! Admiring your collection of fairytale pumpkins and your centerpiece making skills. We like to serve dinner family style. There’s just something about a table full of food that screams “Holidays”. So if the table is big enough we’ll load everything on there from the turkey to the rolls. If you’re limited on space then we recommend doing a sort of half n half style of buffet and family style. Keep your turkey, salads, and heavier side dishes off the table in a buffet format. Have your sauces, dressings, veggies (like the very pretty delicata squash we’re making), and breads on the table. 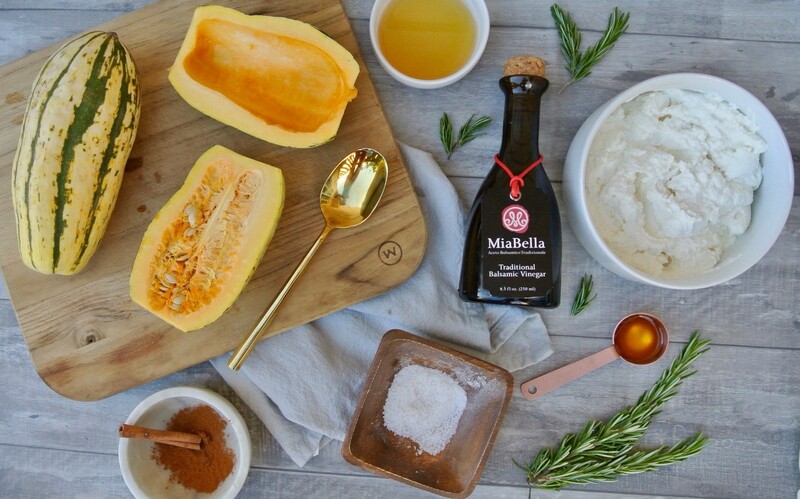 And of course we always have a bottle of MiaBella Balsamic on our table! Either way put a linen out, set the table with flatware and glasses and enjoy the luxury of a dinner with friends! Now as for our Delicata Squash, who knew we could make vegetables so delicious! Let’s discuss. The squash is sweet and slightly caramely. We leave the peel on our squash when we roast it most of the time. It’s chewy and incredible when roasted. You can absolutely peel it if you’d like. And if you leave it on and happen to have a tough piece, just discard it. Also we added a little rosemary because let’s just say that this last month, we’ve had quite the rosemary problem. And of course we drizzled our MiaBella balsamic to add a flavor punch. We could actually eat this entire plate for dinner without anything else! It’s just that good. But it is also great as its intended role as a side dish for holiday dinners and weeknights alike. We recommend assembling just before dinner is served to keep the flavors fresh, but you can easily prepare the squash earlier in the day. While the oven is heating mix the slices of delicata squash with the olive oil, honey, salt, pepper and cinnamon in a large bowl. Let sit in bowl for at least 20 minutes to draw out some of the liquid from the squash. 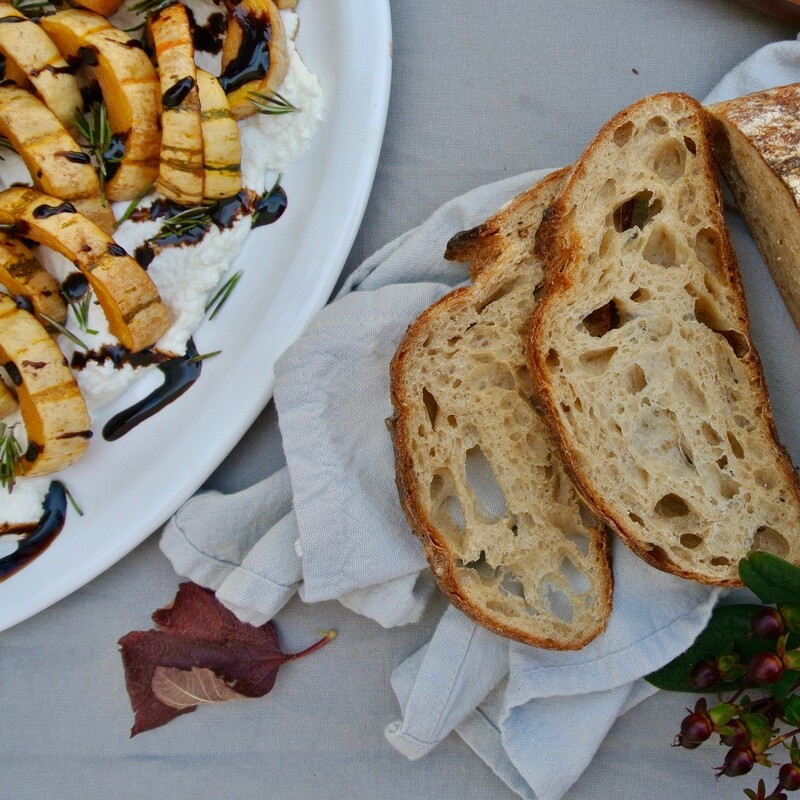 Slather the ricotta on your serving platter and line up the delicata squash on top. Sprinkle rosemary and top with a drizzle of MiaBella Balsamic Vinegar. And Serve!